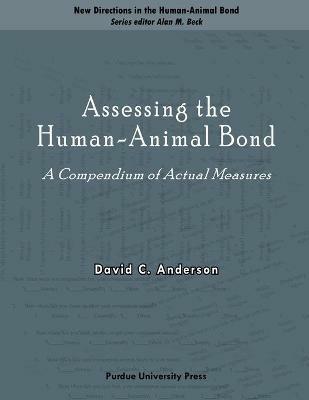 Assessing the Human Bond ?This book gathers, in one place, those measures presently used to study the human-companion animal bond. The measures chosen for inclusion are the most heavily used by researchers, as well as measured that appear to be innovative or relate to the different aspects of the human-companion animal relationship. The measures cover the human-animal bond principally by attachment, but also by fear, abuse, or neglect. David C. Anderson is the author of Humans & Other Species, which was purchased by the American Veterinary Medial Association. Anderson, a retired librarian, continues to follow research in the field of human-animal studies and contributes a bibliographic column to the International Society for Anthrozoology. "This book gathers, in one place, those measures presently used to study the human-companion animal bond. The measures chosen for inclusion are the most heavily used by researchers, as well as measured that appear to be innovative or relate to the different aspects of the human-companion animal relationship. The measures cover the human-animal bond principally by attachment, but also by fear, abuse, or neglect. David C. Anderson is the author of" Humans & Other Species, which was purchased by the American Veterinary Medial Association. Anderson, a retired librarian, continues to follow research in the field of human-animal studies and contributes a bibliographic column to the International Society for Anthrozoology. David C. Anderson is the author of Humans & Other Species, which was purchased by the American Veterinary Medical Association. Anderson, a retired librarian, continues to follow research in the field of human-animal studies and contributes a bibliographic column to the International Society for Anthrozoology.